Imagine this: clear blue skies, swaying palm trees and powdery white sand – one of the Philippines famed destinations which is Boracay Island. But how do you get there? There are a number of ways. Here’s a quick look at our suggested routes and what we think are the easiest ways to Boracay. 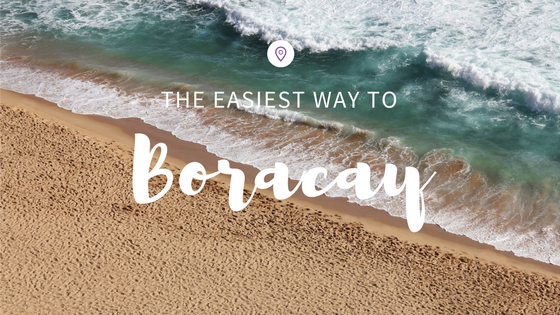 One of the fastest ways to reach Boracay Island is to take a plane from Manila domestic airport and fly to the island of Panay in the Visayas. There are two options; you can either fly to the cities of Kalibo or Caticlan on Panay Island. The flight time to either city from Manila is one hour. There are three airline carriers that fly directly to Kalibo International Airport. They are Philippine Airlines, Cebu Pacific, and Philippines Air Asia. Depending on the season, the cost of a roundtrip flight can range from US$80 to US$200. Once you have reached Kalibo International Airport, you can take a bus to Caticlan Port where can take a short boat trip to Boracay Island. Once you get off the Cagban Port, you can take a minivan transfer straight to your resort. Unfortunately, there are a lot of transfers involved before you reached the island of Boracay. The good news is there is a transfer company who can take the hassle out of your holiday to paradise. Island Star Express has been in the industry since 1999 and they are one of the major transfer companies that service guests to Boracay. See their Services and Rates here. An alternate route and an easier flight are via Caticlan. The planes are smaller though but the transfer time is much less. Once you reached Caticlan Airport, you need to take a short transfer to Caticlan Port, catch a boat to Boracay Island and take a van transfer straight to your resort. There are three airlines that fly direct to Caticlan from Manila and those are Philippines Airlines, Cebu Pacific, and Skyjet. A roundtrip flight can range from US$100 to US$200 depending on the season. Alternatively, if you are arriving or traveling from Cebu, Mactan International Airport has flights departing to Kalibo or Caticlan daily. There are only two airlines that fly direct to Kalibo or Caticlan from Cebu and those are Philippine Airlines and Cebu Pacific. Flights are limited to 2 to 3 per day so we suggest you book ahead. You can also travel to Boracay from Palawan by plane from Puerto Princesa to Iloilo City. Once you arrived in Iloilo City, you will need to take a bus to Kalibo and then on to Caticlan. The bus journey will take you about 4 hours to Kalibo and 6 hours to Caticlan. If you would like to learn more or need assistance on Boracay Airport Transfers, please feel free to e-mail us at hello@islandstarexpress.com. We’ll be happy to help you!